The 2019 Mercedes GLE has made its digital world premiere. Here’s the visual comparison with its predecessor. Third-row seating option has finally made it to the Mercedes GLE with the full model change. The 2019 Mercedes GLE features fully redesigned front and rear fascias, but its profile is more or less the same. The SUV follows the design philosophy of “sensual purity”. At the front, there’s a new octagonal grille with the diamond pattern, which is more upright. The AMG-esque bumper with a version of the A-wing apron tries to be elegant than aggressive. Overall, the front fascia is more emotive. 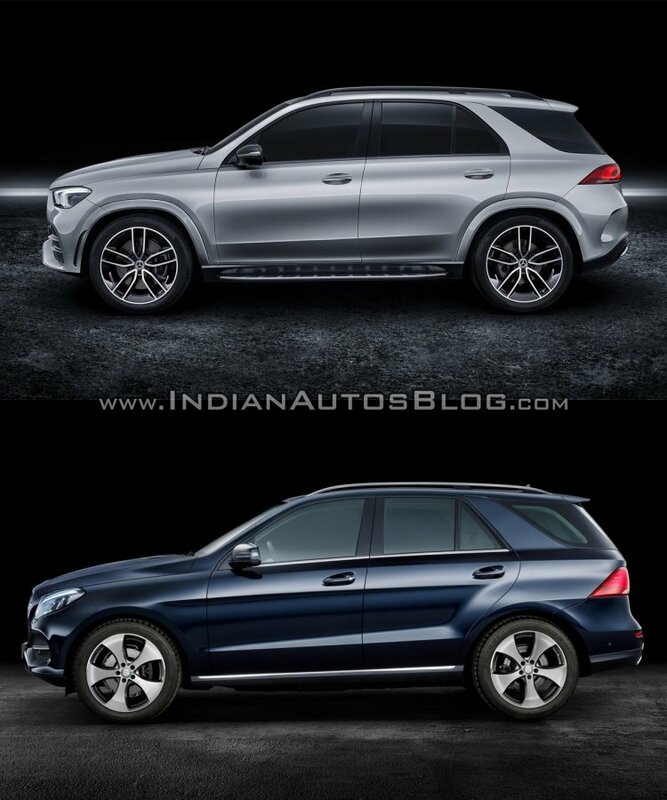 Moving to the sides, the hallmark C-pillar remains the distinctive identity of the GLE. The new door design leads to a more curvaceous greenhouse. The squarish wheel arches with prominent liners are aimed at giving a more muscular appeal, and they house wheels in sizes from 18 to 22 inches. The all-new Mercedes GLE has an 80 mm longer wheelbase. 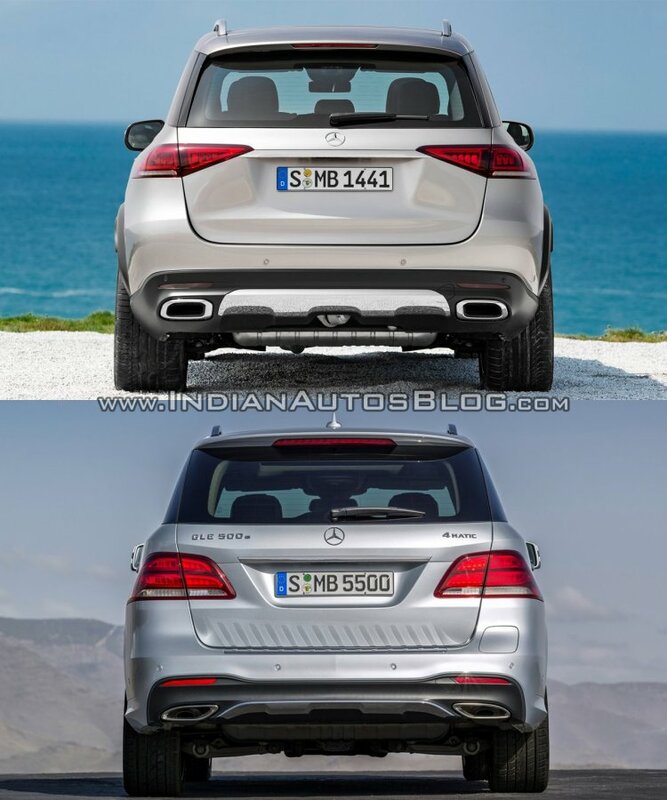 From the rear, the all-new Mercedes GLE is sportier, thanks to the sleeker and sharper wraparound tail lamps. The chrome work on the skid plate and exhaust tailpipes form an interesting detail here. The interior is more streamlined, technologically advanced and spacious. Particularly worth mentioning are the plusher dashboard and the minimalistic centre console. The large AC vents on the flanks of the adjoined 12.3-inch virtual instrument cluster and 12.3-inch floating central display are typical of SUVs. Four small rectangular AC vents, an ultra-compact climate control panel, two prominent grab handles are some new design elements worth noting on the centre console. Thanks to an 80 mm longer wheelbase (2,995 mm), there’s more space for increased rear comfort. The legroom in the second row has increased by 69 mm to 1,045 mm. As a world first, 6-way electric adjustment is available for the second-row seats. The headroom has increased in the rear by 33 mm to 1,025 mm. The more upright A-pillar has improved the spaciousness and entry comfort in the first row. For the first time, a 7-seat option is available. The BMW X5 rival has the best the aerodynamics in the segment now, with the drag coefficient as low as 0.29 Cd. A major highlight of the new generation Mercedes GLE is its E-Active Body Control active suspension system on a 48-volt basis. Billed as the “world’s most intelligent SUV suspension”, it is the only one in the market where the spring and damping forces are individually controllable at each wheel. Another feature worth noting is a completely new off-road function called ‘free-driving’. If the SUV is stuck in a sand dune, for example, this function can help to free it more easily. If possible, the suspension level is automatically raised and lowered several times, which changes the ground pressure of the tyres, improving the traction. Another new function for off-road driving is individual wheel actuation that allows the driver to adjust the level at each wheel individually (via the infotainment system), thus improving the way the SUV behaves on rough road terrain. This function is useful in situations like when one wheel is stuck in a ditch or a wheel spring is fully contracted. The 2019 Mercedes GLE features the MBUX infotainment system with a new 'Interior Assist' that allows for operation of different functions by movement recognition. 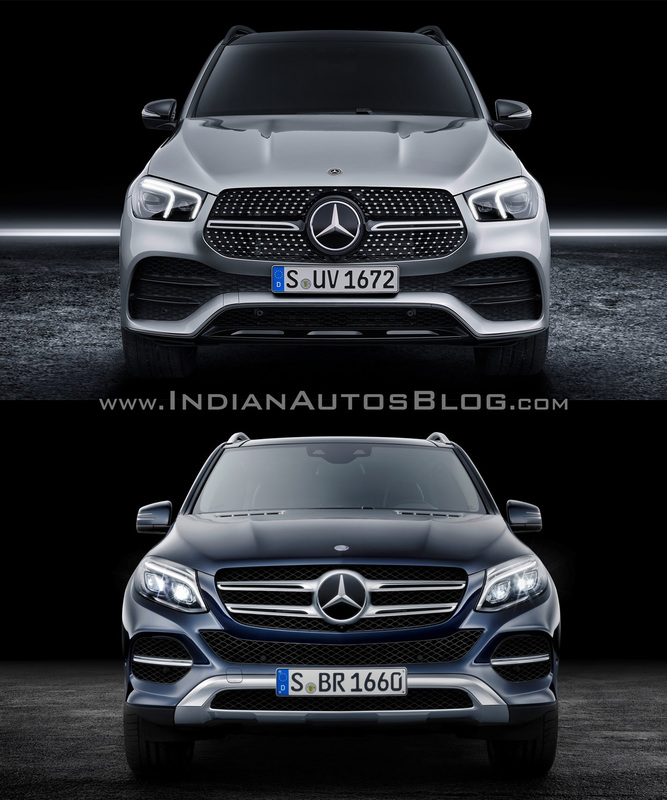 Daimler has planned a completely new range of engines for the 2019 Mercedes GLE. However, right now, it has revealed only one. It’s a six-cylinder petrol mill that produces 270 kW (367 PS) and 500 Nm of torque, electrified with 48-volt technology. An extra 16 kW (22 PS) and 250 Nm of torque are available via EQ Boost over short periods. The 9G-TRONIC 9-speed automatic transmission and the 4MATIC AWD system work together to send drive to the wheels. Other engines, including diesels and a plug-in hybrid, will follow. The 2019 Mercedes GLE will hit the first markets in early 2019. Expect its Indian launch to take place later the same year.